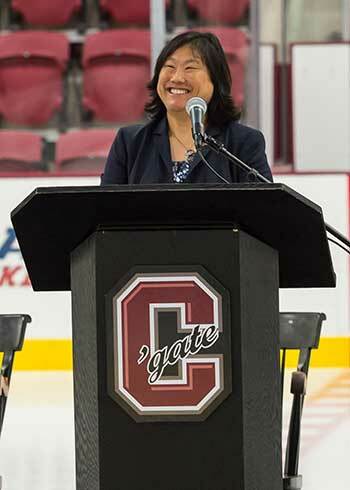 In a letter to the campus community, President Brian W. Casey announced that Vice President and Director of Athletics Victoria Chun ’91, MA’94 has been named director of athletics at Yale University, effective July 1, 2018. Colgate will begin a national search for her successor immediately. Chun was named Colgate’s director of athletics in 2013 and was promoted to vice president and director of athletics in 2015. Her list of accomplishments during the last five years includes the construction of the Class of 1965 Arena and Beyer-Small ’76 Field. Her teams have won titles, earned NCAA tournament berths, cracked the top five in national rankings, and set numerous records. Even as she encouraged student-athletes to victory in competition, she also spurred them on to achieve a 98-percent graduate success rate, second in the nation. Alongside her work as Colgate’s athletics director, Chun has also served as a member of the NCAA Division I Council and the new Division I Football Competition Committee, vice chair of the Division I Football Oversight Committee, board president of Women Leaders in College Sports, and member of the Harvard University Board of Overseers.